BELGRADE, Yugoslavia (CNN) -- Yugoslav Deputy Prime Minister Vuk Draskovic was fired Wednesday, three days after he said the Serb leadership should stop lying about the military and humanitarian situation in Yugoslavia. 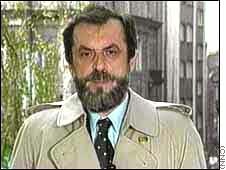 "My voice of reason has now been put out," Draskovic told CNN's Brent Sadler. Draskovic told Sadler shortly after his dismissal that he believed he had been speaking for the government of President Slobodan Milosevic when he said it should make a deal to end the NATO bombing. Yugoslavia must be prepared to "accept a U.N. mission under the flag of U.N. international forces here for establishing and protecting the peace in Kosovo," Draskovic told CNN on Monday. But the Tanjug news agency said that Yugoslav Prime Minister Momir Bulatovic fired Draskovic because of "public statements which were contrary to the government stands and jeopardizing the respect of the federal government." NATO began bombing Yugoslavia after Milosevic rejected a peace plan that included international troops in Kosovo. Draskovic, who headed the opposition Serbian Renewal Movement before joining Milosevic's government, told Sadler he would "continue to fight for the defense of Serbia in any way I can." But his sacking appeared to bring into question Western hopes for moderation in the Yugoslav government.